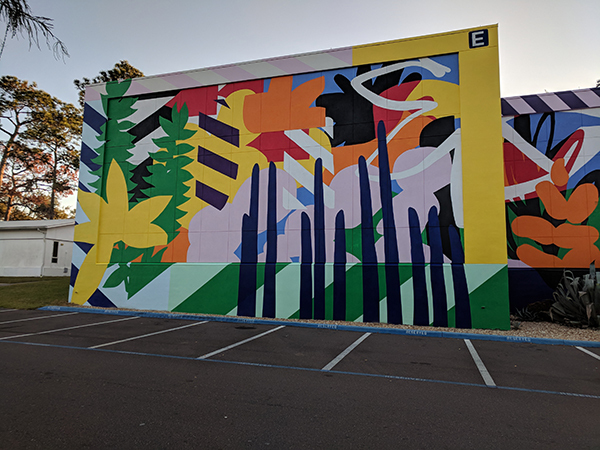 November 27, 2017 – A new mural on Building E is brightening up the Northwest Campus. The Santa Fe College Fine Arts Department teamed up with 352walls/Gainesville Urban Art Initiative to bring Irish artist Al Maser to Gainesville for the project. SF Fine Arts students assisted Maser and worked for nearly two weeks to complete the project. Maser wanted the students to assist not only to help speed up the process of completing the giant mural, but also to give them a sense of ownership over it. Because the students were able to assist Maser, they will now be able to teach future students about how the project was completed and how it will need to be maintained in future years. SF is honored to have the largest mural in the 352walls project to date on our campus.